Powers: The Absorbanoids can absorb any kind of energy directed towards them. They can also absorb energy from people and objects by merely coming into contact with them, increasing their own power levels and strength. Little is known of the Absorbanoid creatures that hail from the vast sub-universe known as Dimension-X. 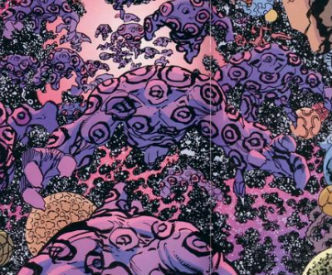 They first came to prominence when Dr. Nirvana managed to open a portal to Dimension-X and gain control of an army of them, ultimately unleashing them upon his long-time nemesis, Mighty Man. Mighty Man, accompanied by Dragon, were overwhelmed by the army of Absorbanoids who consumed their energy leaving them in a weakened state. Just prior to the confrontation the group of Absorbanoids had absorbed the firepower of the Demon Dogs, and during their attempt to consume Dragon and Mighty Man’s energy triggered a massive explosion, possibly due to an energy overload. Apparently there are limits as to how much energy the Absorbanoids can steal from outside sources. Despite their enslavement by Dr. Nirvana, the Absorbanoids’ true allegiance was to the most prominent dictator in Dimension-X, Deathseed. Deathseed assembled multiple armies of Absorbanoids for a planned invasion of Earth in which the villians planned to enter through a portal maintained by Dragon and his Liberty League. Through the combined efforts of Dragon, his family, and teammates, the invasion was averted. Deathseed was killed at the hands of Jennifer Dragon and the Absorbanoids were shutdown instantly. Several years later, Deathseed was resurrected in the monster form of Rex Dexter, an entity dubbed Monster Rex. A portal from Earth to Dimension-X was opened up when Rex and his family were being searched for after spending months lost in that realm. Monster Rex emerged through the portal with a huge army of Absorbanoids whom he commanded to drain all of Earth’s resources. The idea was for the Absorbanoids to steal all of the planet’s energy resources so that Monster Rex could use Earth as a springboard for an invasion throughout all of existence. As the Absorbanoids swarmed over Chicago, Malcolm Dragon and Battle Girl used weapons to cut down their ranks. After the real Rex Dexter returned and killed his original body, the Absorbanoids’ threat vanished. The heroes that had assembled to deal with their invasion had little trouble dealing with the remnants of the alien threat.